Feildes Weir Lock Services is a minor waterways place minor waterways place place on the waterways major waterways place village town city on the Lee and Stort Navigation (River Lee) between Waltham Town Road Bridge No 42 (Road Bridge to Waltham Cross (West) and Waltham Abbey (East)) (6 miles and 5¼ furlongs and 6 locks to the south) and Rye House Junction (Junction of Rivers Stort and Lee) (¾ furlongs and 1 lock to the north). The nearest place in the direction of Waltham Town Road Bridge No 42 is Feildes Weir Lock Weir Exit (Channel leading to the Weir); ¼ furlongs away. 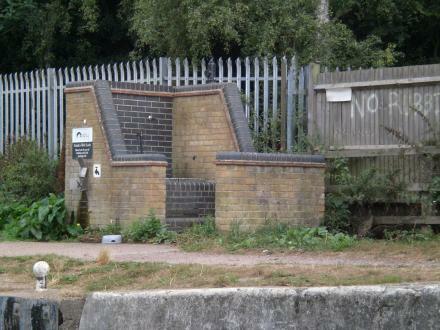 The nearest place in the direction of Rye House Junction is Ratty&apos;s Lane Bridge No 56; ¼ furlongs away. Hoddesdon, EN11 0EH — 1061 yards to the northwest. Unit 3, Francis Works, Geddings Road, EN11 0NT, London, EN11 0NT — 1362 yards to the southwest. Hoddesdon, EN11 0 — 187 yards to the southwest. Hoddesdon, EN11 0AS — 1462 yards to the southwest. Ambition Broxbourne Business Centre, Hoddesdon, EN110FJ — 756 yards to the west. 4 Pindar Rd,, Hoddesdon, EN110DB — 739 yards to the northwest. Stanstead Road,, Hoddesdon, EN11 0JB — 986 yards to the northwest. LIFE CHURCH, RYE ROAD, Hoddesdon, EN110JB — 986 yards to the northwest. Hoddesdon — 727 yards to the northwest. 137 Rye Road, London, EN11 0JR — 1462 yards to the west. Broxbourne Business Centre, Pindar Road, Hoddesdon, EN11 0FJ — 740 yards to the west. Hoddesdon — 1024 yards to the northwest. Unit 5, Plumpton House, Plumpton Road, Hoddesdon, EN11 0LB — 1147 yards to the northwest. Unit 5, Plumpton House, Plumpton Rd, Hoddesdon, EN11 0LB — 1211 yards to the northwest. 27 Ambition Broxbourne Business Centre, Hoddesdon, EN11 0FJ — 756 yards to the west. Unit 9 Broxbourne Business Centre Pindar Road, Broxbourne, EN11 0FJ — 756 yards to the west. Rye House, Rye Rd, London, EN11 0 — 781 yards to the north. Rye Road, Rye House, Hoddesdon, EN11 — 552 yards to the north. London — 1547 yards to the west. Rye Road, London, EN11 0 — 907 yards to the northwest. Pindar Road, Hertford, EN11 0BZ — 739 yards to the northwest. Global House, Geddings Road,, Hoddesdon, EN11 0NT — 1246 yards to the west. Roydon — 1589 yards to the east. London — 1503 yards to the southwest. 5 Haward Road, Hoddesdon, EN11 0LU — 1216 yards to the northwest. 48 Hoddesdon Industrial Centre, Pindar Road, Hoddesdon, EN11 0FF — 794 yards to the northwest. Unit 16 Pindar road, Hertford, EN110DE — 739 yards to the northwest. Rye Stadium, Hoddesdon, EN11 0EH — 1024 yards to the northwest. Roydon — 1486 yards to the east. Rye Rd, London, EN11 0JR — 1510 yards to the west. rye road hoddesdon, London, EN11 0 — 689 yards to the north. Unit 5, Hoddeson Industrial Centre, Pindar Road, Hoddesdon, EN11 0DD — 739 yards to the northwest. Dobbs Weir Road, Hoddesdon, EN11 0AS — 1287 yards to the southwest. London — 1340 yards to the northwest. Haslewood Ave, Hoddesdon, EN11 8 — 1567 yards to the west. Brewery Road, Hoddesdon, EN11 8HF — 1626 yards to the west. 1198 yards to the southwest. 1078 yards to the southwest.